Paramount Pictures and Hasbro, Inc. today announced that they will be teaming up to produce and distribute content based on Hasbro brands, as well as original stories. The two companies will collaborate on live action and animated films, with Hasbro's Allspark Pictures and Allspark Animation playing an active role alongside Paramount Pictures in development and production. This announcement expands upon an existing relationship between the two companies. Hasbro and Paramount have partnered on five Transformers movies to date, as well as two G.I. Joe films, and the first Transformers spinoff, Bumblebee, is slated for December 2018. Here's what Brian Goldner, Chairman and CEO, Hasbro, had to say in his statement. "Paramount has been a valuable partner of Hasbro's for more than a decade, and we're looking forward to taking our relationship to the next level. Storytelling, in its many forms, is revolutionizing our business and differentiating Hasbro in all sectors where we operate. We look forward to collaborating with the talented team at Paramount to create powerful new stories for kids, fans and families globally." While terms of the relationship are not being disclosed, Paramount and Hasbro will partner on financing projects at varying levels of investment, and Paramount will distribute the projects produced during the five year term of this deal worldwide. Paramount and Hasbro will also collaborate on television programming. Hasbro's Stephen Davis and Simon Waters revealed in March that the studio is eyeing a G.I. Joe millennial reboot, which will be catered to this younger generation, Paramount Pictures Chairman and CEO, Jim Gianopulos, had this to say in a statement. "Hasbro has an enormous array of exceptional brands, so this expansion of our relationship is incredibly exciting. We look forward to working with Brian Goldner and Stephen Davis and the Hasbro and Allspark teams to create extraordinary film properties for all audiences." Hasbro recently hired Greg Mooradian as president of Allspark Pictures, with responsibility for live action film and television. Allspark Animation, the company's label for animated film and television content, is led by Hasbro's Meghan McCarthy. Hasbro acquired Boulder Media in 2016, a leading animation studio based in Dublin, Ireland, to produce its television and film animation. Hasbro Studios, its distribution arm which the company founded in 2009, distributes TV and digital content to more than 190 territories globally. The entertainment division reports to Hasbro's Chief Content Officer, Stephen Davis. Back in January, there was also talk of a Transformers and G.I. Joe crossover movie, with director D.J. Caruso, who was once set to direct G.I. Joe 3, revealing that the end of his script brought both Transformers and G.I. Joe franchises together. 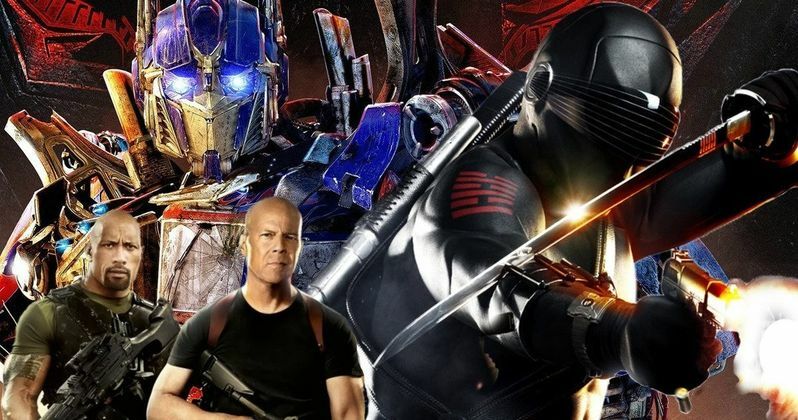 The director also revealed that the studio wasn't quite ready to bring in both of those worlds yet, but added that it will probably happen once director Michael Bay backs away from the franchise. With this new five-year deal announced today by Paramount Pictures, that crossover could become a reality sooner rather than later. Hopefully we'll hear more about these Paramount and Hasbro projects soon.